Do some sunscreens actually cause cancer? Rate your sunscreen. 1) Let’s prevent skin cancer and slow down the aging process by blocking harmful sun rays. 2) Let’s use a sunscreen that does not cause cancer by polluting your body with chemicals that are absorbed into our bloodstream. I am glad that this is a popular topic because sun protection should be a priority for your overall health. The skin is the largest organ in the body, and we need to remember that and treat it with more respect. Blocking UVA (long wave rays) and UVB (medium wave rays) is only part of what we need to consider. We also need to consider the quality of product we are slathering all over our precious skin, after all we do absorb up to 60% of what we apply topically into our blood stream. So our product choices really can affect our overall wellness. The best protection really is to stay covered up. However when you must expose your skin the natural choice is always the better choice. For years, more and more sunscreen products are on the market with each one smelling better and easier to apply which usually means more chemicals. We have been advised to coat these chemical sunscreens all over our body but recently there has been talk that the chemicals in those products may actually be doing more harm than good. It now appears that many heavily-used chemical sunscreens may actually increase cancers by virtue of their free radical (unstable molecules that damage cells and cause cancer) generating properties. Also, many commonly used sunscreen chemicals have strong estrogenic actions that may cause serious problems in sexual development and adult sexual function, and may further increase cancer risks. 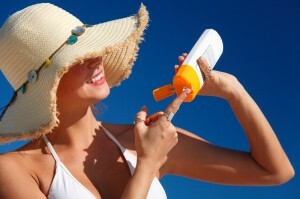 TOP 12 CHEMICALS USED IN SUNSCREENS THAT YOU SHOULD AVOID! These are in order of most commonly used chemicals to least. You probably see the first 4 in many standard sunscreens, like Neutrogena and other Johnson and Johnson products that are marketed to be gentle choices. 1. Benzophenones (dixoybenzone, oxybenzone)- one of the most powerful free radical generators known. It is used in industrial processes as a free radical generator to initiate chemical reactions. 2. Avobenzone [butyl-methyoxydibenzoylmethane; Parsol 1789] – This is the only chemical sunscreen currently allowed by the European Community. However, its safety is still questionable since it easily penetrates the skin and is a strong free radical generator. 6. Parabens (butyl-,ethyl-,methyl-,and propyl-) – linked to breast cancer. Try to look out for these in other skin product, not just sun protection. As far as we know these days mineral sunscreens beat the chemical sunscreens by a long shot in safety. If you stick to minerals combined with natural ingredients you should be ok. There could be other ingredients included with the minerals but make sure that the active ingredients are minerals and there are none of the harmful chemicals we listed above. Another mineral that pops up on the list and may even repel UV rays is Iron Oxide. You should look for a natural product with at least 7-12+% of zinc and titanium. Many natural sunscreens are also water resistant because their mineral properties stick to your skin through swimming and sweating. You should still reapply every 2 hours and after water activity for ultimate protection. TOP 10 MINERAL BASED SUNSCREENS THAT WE RECOMMEND! Of course you should always look for an SPF of 30+. You may also want to purchase a product with some antioxidant like Vitamin C or Green Tea extract that can actually protect the skin from the oxidation the sun is causing. Think of these products as a double benefit. Even if the sun sneaks though the minerals it will be disabled by the antioxidant. Beware of nasty chemicals that can absorb into your blood stream. Opt for more natural choices that are mineral based. Always wear a hat and reapply at least every 2 hours.